In the beautiful little town of Frederikshaven, on the north shores of Denmark, a son was born to Jens Hansen Rove and Maren Kristen Larson, on the 3rd day of May, 1825. They named him Lars Rove Jensen. At an early age, Lars Rove became a sailor, as most of the young men did in those days, in the countries that bordered the seas. He crossed the ocean nine times, and he was shipwrecked off the coast of Brazil, and also near Galveston, Texas. This must have been somewhat frightening to a young man still in his teens, yet they were exciting for him also. In April of 1849, Lars Rove was a crew member on the ship "Hartley," that was sailing from Liverpool, England, to the United States of America. Now, this ship was carrying "Mormons" across the waters to their beloved Zion, and while on this special ocean trip Lars Rove Jensen heard his first Mormon sermon preached by Elder William Hulme, who was presiding over the saints on this voyage. Lars Rove was very interested in what lie heard and he had a feeling that this doctrine was true. So upon the ship's arrival in New Orleans he was baptized into the Church of Jesus Christ of Latter Day Saints, on the 29th day of April 1849, just before he turned twenty-four years of age. A John Everett and George and Alfred Percy were baptized the same day but Lars Rove Jensen was the first Scandinavian to be baptized a member of the "Mormon" church. Lars Rove Jensen, in company with John Everett, returned to Europe once more, but in the fall of that same year, 1849, he again returned to New Orleans, this being the ninth time for him to cross the ocean. Lars stopped in New Orleans that winter, and secured a job fishing for oysters. In the spring of 1850, he began the trip to Utah, but when he arrived at CounciI Bluffs, he again stopped and secured work on a ferry boat until spring of 1851, when he crossed the plains in the James Allred company, arriving in Salt Lake City in September of I851. That fall he built a house for Leonard Smith and lived with him that winter. He was then ordained a Seventy and with the permission of Joseph Young, who was president of the Seventies, Lars Rove Jensen went to California, returning three years later. He had a purse filled with gold dust and he went directly to President Young's office and told the clerk to take out one-tenth of the gold dust for his tithing. It was at this time that Lars Rove was first introduced to Pres. Brigham Young. Lars then reported himself to President Joseph Young, who asked him, "Have you kept yourself straight?" Lars answered, "Yes. In the fall of 1855, the same year that he returned from California, Lars married Jane Duston, of Alpine, Utah. In 1857, at the time that Johnston's Army was marching into Salt Lake City, a call came for a company of Cavalry from Lehi, Utah, area, and Lars Rove was one of the men chosen for this company, and on September 28, 18,57, under the direction of Captain Sidney Willes, this company was stationed in Echo Canyon. Their job was to block Echo Canyon against the entrance of the troops. They constructed fortifications in the mountains. Two months later, the company was released to return to their homes, on November 30, 1857. Lars Rove Jensen was a private in this Company. In 1862, Brigham Young (at a request from President Abraham Lincoln, for a company of Utah Cavalry to serve for the United States) sent the Cavalry east to protect the mail and telegraph lines, from the North Platte River below Independence Rock to Fort Bridger, from the Indian attacks. Lars Rove Jensen, joined the Lot Smith Company in Salt Lake City on the 3rd of April, 1862. This group had traveled this same route during the attack of Johnston's Army and now [heir job was to protect the property of the Overland Telegraph and Mails Co." These men, including Lars Rove Jensen, furnished their own horses, saddles, bridles, and all their own equipment at their own expense, serving at their own expense, which was something otherwise "unknown in the history of the Civil War. These men rendered specific service during the Civil War. It was national service and it was credibly and patriotically rendered. These pioneer soldiers guarded the mail route and telegraph lines successfully. Upon Lars' release, the family moved to Cache Valley and was one of the first settlers there. Four children were born to Lars Rove and Jane Dunston Jensen. (1) Lars Dunston, was born 14 Feb 18,58 at Alpine, Utah. He married Laura Stanton. He died I Jan 1946, at San Diego, Calif.
(2) Thomas Hansen, was born 23 April 1860, at Alpine, Utah. He married Julia Hills Johnson. They had six (6) children. He died 3 Dec 1938, at San Diego, California. (3) Christin Maria, born 29 Sept. 1861, at Richmond, Cache, Utah. She married David A. Johnson and had ten (10) children. She died 9 July 1933, at National City, California. (4) Jane Mariah, was born 2 Nov. 1863, at Richmond, Cache, Utah, and died 6 Dec. 1863. Soon after the baby's death, Lars' wife Jane died, leaving him with three small children, so he returned to Alpine. and on March 7 1857, Elizabeth Ann Freestone and John Langston were marred. John Langston had another wife, Clearlinda Phillips Langston. Elizabeth Ann and John Langston had two children, Elizabeth Ellen, born 4 April 1858 and George Heber, born 21 Sept. 1860. Elizabeth Ellen married Lyman Johnson Swett, on 4 July 1877 and they had thirteen children. She died 11 December 1926 in Vernal Utah. George Heber married Ann Mary Nielson on 1 January 1884. They had seven children, he died 23 April 1939 in Vernal, Utah. Elizabeth Ann lived with John Langston about four years, she then divorced him and returned to Alpine, Utah, to live with her mother. On the 27th of August 1864, Elizabeth Ann Freestone (Langston) and Lars Rove Jensen were married and they settled in Alpine, Utah. Now Elizabeth Ann had two children and Lars Rove had three children so they started out their new married life with five children. Lars Rove raised Elizabeth Ann's two children and Lars Rove's two boys were raised by Elizabeth Ann, and his daughter lived with them much of the time and with her grandmother part of the time. Lars Rove's two sons by Jane Dunston, Lars and Thomas, paid a beautiful tribute to Elizabeth Ann at the time of her death - saying that she was a noble and wonderful woman and that their own mother could not have been better to them nor have taught them better. (2) Anna Louisa, born 116 April 1867, married Abinadi Porter and they had ten children, she died 20 March 1934. (3) William Richard, born 7 October 1868 and died 10 October 1869. (4) Joseph, born 19 February 1870 and died the same day. (5) James Franklin, born 31 March 1872 and married Laura Estella Whitmill. They had three children; Laura passed away at twenty-nine years of age and James Franklin married Eva Law -- they had one child. James Franklin was accidentally shot and killed on 1 September 1917. (6) Leonard Alonzo born 7 September 1874 and died 9 October 1875. Elizabeth Ann and, Lars Rove worked hard on their little farm in Alpine and they were active in civic and social affairs -- Lars Rove played the violin very well (as did some of his sons) and' he played for dances - so he was known as '' Fiddler Jensen". Children. She died I November 1944. While they lived in Springlake, they had two children get married. Lars' daughter, Christina Marie, by his first wife, and Elizabeth Ann's daughter by John Langston, Elizabeth Ellen. In the fall of 1878, Lars sold their farm in Springlake and rode away to find another farm. When he reached Salt Lake City, he met a friend, who told Lars about a widow and her five children, who needed someone to pay their fare from Scotland. Lars said he needed his money to buy another farm, but his friend said, "You don't need a farm, go to Orderville". So Lars spent the money to repay the fares from Scotland for Agnes Work Smith, who was born 28 Dec. 1840, and her five children. On 23 September 1878 while still in Salt Lake, Lars Rove married Agnes Work Smith in the endowment house, and took her and her five children to Springlake with him. That same year he moved both his wives and families to Orderville, Utah, where they lived the United Order for five years. Here the houses were small and built side by side, forming four walls like a fort, with a large hall in the center. This was a very different life for Lars and his families. The wives would spin and knit. Two of the boys, Reuben and Frank worked in the Carpenter shop, while Annie worked in the kitchen and in the factory. Everyone had a job. Lars Rove herded sheep and while he was with the herd, he had a dream... he was walking up main street in Salt Lake City when he came to an alley: upon walking in this alley, he saw on the right-hand side Brigham Young, who had a veil over him. Brigham Young stretched out his hand, shaking hands and smiling, he said, "You have gotten through alright. This life was quite different in Orderville. In the morning a bugle was blown and everyone came into the large hall where community prayer was held, then everyone sat at long tables and ate their breakfast. No one was allowed to have food in their living quarters. It was all in one big kitchen. Some people worked in the garden and some in the orchard, and some in the factory, where they made all the clothing and bedding. A bell rang at lunch time and they all assembled in the center hall again and ate lunch. At supper time, the bugle was sounded and they all assembled for supper, and here they had their evening prayer together. All their meetings were held in this large center hall also. While Lars and his two wives lived in Orderville, two children were born to Elizabeth Ann (8) Emma Jane, born 3 Oct. 1879. She married David Louis Price on 29 January 1901. They had seven children. She died 20 Sept. 1950. (9) Robert Samuel Hamilton Jensen, born 29 January 1882 and died 16 July 1883. Two daughters were born to Agnes Work Smith Jensen. Agnes Sarah, born 27 Aug. 1879, and Jane Elizabeth born 11 March 1882. She died 11 July 1951. In 1883, Lars Rove left Elizabeth and his children in Orderville and took Agnes and her children and moved to Vineyard -- west of Orem. Elizabeth had a very hard time to get food, clothing, and shelter for herself and her children. Later on her sons built her a three room house with a porch. 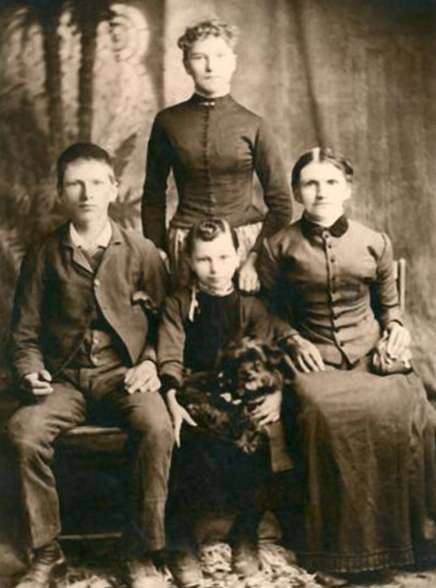 In 1897, Lars Rove's Children and their Mother, Elizabeth moved to Basalt, Idaho. It took them 5 weeks and 5 days to make the trip by wagon train. Elizabeth and her daughter, Emma came to Salt Lake by train so Elizabeth could do Temple work. Lars and Elizabeth Ann's son, James Franklin' was called on a mission and left on 9 July 1897. Elizabeth Ann sent for Lars Rove, as she was in very poor health. She returned to Vineyard with Lars and remained with him until 5 Sept, when the Temple opened. At this time she saw a doctor and found that her heart was in a very poor condition. In April 1898, their son, Lewis Reuben Jensen went on a mission to the Southern States. Elizabeth and her daughter, Emma, were living in Vineyard at the time of Elizabeth's death on 27 Nov 1898. Their two sons were still on their missions. Elizabeth Ann is buried in Alpine, Utah. Lars Rove Jensen experienced the crickets eating their crops and at times he lived on sego roots and wild onions. 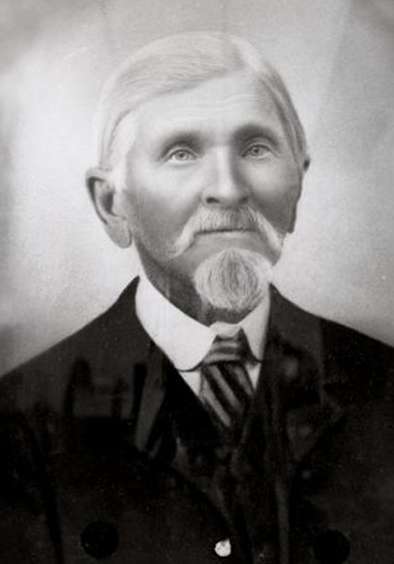 Lars Rove Jensen was a High Priest, in good standing in the Church of Jesus Christ of Latter-day Saints at the time of his death, 9 Nov. 1909, at the home of Jane, his youngest daughter by Agnes Work Smith Jensen. He was 84 years old. At his request, he is buried beside Elizabeth Ann in Alpine, Utah. in the front: James Franklin, Emma Jane and Elizabeth Ann Freestone Jensen.